My name is Elaine. I have had psoriasis for more than 10 years; mostly on my legs. Its condition got much worse approximately 3 months ago after I use new medication Taclonex: psoriasis almost completely covered my legs with terrible redness and itching. After the first couple of days of using Champori spray and crème redness and itchiness started to get better. Now, after 3 weeks of treatment, there is no more itching, the color of patches is light pink, and some spots almost disappeared. Hello Champori. I was both surprised and pleased with the almost instant effect that your cream and spray had upon my case of Psoriasis which I have suffered with for over twenty years. I changed my diet about six years ago to mostly vegetables and veggie drinks and my psoriasis almost disappeared for a while but as you can see it does flare up from time to time, I started on your cream about two weeks ago and here are some before and after photos.Thank you so much for cream -spray combo it really does work! Hi! First of all, I would like to say “Thank you” for coming up with Champori. I am 45 years of age and had psoriasis more or less for 17 years now. My medications were the usual topical & oral steroids and immune suppressant drugs. I sort of got desperate or you can say, tired of just having the same medications since it seems that these drugs have adopted already to my system and are not working anymore. 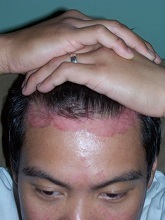 My psoriasis started getting so active again this March 2009. I don’t remember already the last time it acted up so much this way. I ordered your product in July 2009 and for about a month I just kept on applying it all over my body. I would say that 90% of my lesions disappeared! And at present all my lesions are gone and are under control. 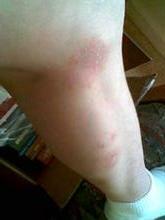 Proof of these are shown on the attached photos on the before and after of my psoriasis lesions on my arm. Your Champori really, really, really helped so much. Now I have told about your website with some of my friends whom I know have other friends suffering also from psoriasis and yes, eczema. Again, my deepest Thank you and for sure I will be keeping Champori always readily available with me. God bless…..
My mother has been suffered by Psoriasis for 6 years. She tried all kinds of medicines in China but no one could really solve her problem until I bought champori psoriasis cream for her in May this year. She felt changed better only after 2 weeks of using it. From then on, her condition was improving day by day. The second photo was taken just after one month she used it. I am so glad to find your stuff to help my mother from chronic suffering. Hi there. 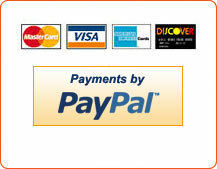 I just wanted to send an email and let you know about the success i have had with your product. I have had psoriasis for around 2 and half years. I've been to Dermatologists who have prescribed me numerous creams all of which have been unsuccessful. Hating the look of it over my arms and legs I was always wearing long sleeves and pants to cover it up - even in the middle of summer. Recently I was searching on the internet to see what other people had had success with. I came across a few threads where they were talking about Champori product. So, I checked out your website. I live in Australia so was very happy to discover that you ship overseas. I've been using the spray and cream now for 2 weeks and can't believe the change. I can only imagine how much more it will improve over the coming weeks. I will definitely keep buying. I have attached some before and after photos for you to see. I have got more but they are taking forever to attach. Thanks so much for such a wonderful product. I am 29yrs old and had psoriasis since 18. For years I have had to use steroid shots and creams… Usually sunshine and strict dieting help too, but nothing like this product! … I have been using your spray and cream for a month and a half and the results as you can see are truly amazing!! I just recently started using your product for psoriasis and can say that the itching and redness have completely gone away. I'm currently serving in Iraq with the US Army. I know your product says to say refrigerate, but what will happen to the life of the product if I can't always keep it cold? My room has A/C and stays at about 68-72 degrees F all day. Again, thanks for an awesome product, my dad and I both have psoriasis. He turned me to this site as both him and I have had no reactions to any other form of treatment. I am very pleased to give you my feedback.. I have had bits of proriasis for most of my life. Initially I used prescription creams which I feel ended up damaging my skin and making the condition worse. I have therefore been desperate fo find a Natural product that would work for me, but the others I have tried were very poor. I search the "web" as I always do and came across your website. At that time you had a free 1/4 oz sample jar on offer so I gave it a go. I am so pleased that I did! 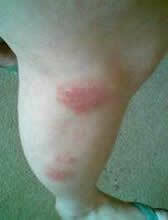 I had patches of psoriasis on my elbows, wrists, knees, face, ears, hairline, back and upper thighs. As I only had a small sample to try, I decided to restrict it to the areas on my body that show. My elbows, wrists, face and knees, and to use it only twice a day. Wow, within few days I was amazed with dramatic improvement. Now my skin is the clearest it's been for over three years. That's why I bought a bigger jar. I can now concentrate on applying the cream to the rest of my patches. I am really over the moon with the results and will never want to be without the cream. My entire body was covered, I was VERY depressed and VERY itchy. Champori gave me back my self esteem and my skin. I get teary and it's hard to talk about. I'm incredibly thankful. I could go on for pages and pages but I would cry a lot explaining how much it hurt socially and physically. However now I am crying tears of joy because it's gone, it's all over thanks to your fabulous product. I used it for two months the spray and the cream but I noticed an improvement in the way my skin felt after two or three days. I have had psoriasis on my feet and nails for about 4 years. I am a health care provider and at times the pain and breaks in the skin on my feet has been incapacitating. I was also about to lose one of my nails. The cream and spray have been a godsend for me. After only about 2 months of treatment my feet are 85% better and my nail is re-growing normally. I have tried dozens of prescription products and I have spent thousands of dollars on doctors and prescriptions. Your product works much better than any of them. The prescriptions more or less kept the psoriasis from advancing (some of the time). But the Champori products actually made it clear up with healthy skin emerging. Thank you so much, your herbal spray and cream are the first things that have actually helped me. Psoriasis first showed up in my life in my early teen years. I have had it on and off for the last 17 years of my life and I have tried many different products. Some worked at first but the psoriasis would always prevail. I was first intrigued by your products because I didn't want to have to use strong steroids on my skin for the rest of my life and I have been looking for a natural alternative. I have tried many natural treatments but Champori sprays and creams have been the best product that I have used. As you can see in the photos the redness has decreased drastically on my head and it is totally gone from my cheeks. The best part about using your cream is that the itching and flaking is 95% gone and there is no painful stinging. There are still some dark spots on my head and legs but they seem to be decreasing and I will continue to use this product. I have recommended this product to my brother as he has psoriasis as well and I am sure he will have similar results. Thank you very much for creating such a wonderful product! Hi, I would just like to say how much your cream has helped my facial dermatitis. Even though it was minor, it was quite embarrassing when I had a flare up, so I was quite skeptical when first purchasing but I can honestly say it has totally cleared it up and made my facial skin much healthier. Pharmaceutical companies should be scared of you! Thank you so much. Hello, I have had psoriasis since childhood. It seemed to have become less and more manageable as I got older. However, this past terribly cold and dry winter (2009) my psoriasis had taken a turn for the worse and became unmanageable. My psoriasis flared worse than ever. The patches were thick, itchy and sometimes would crack and bleed. I had tried many remedies from variety of recommended baths to lotions, oils and creams. All resulted with very little to no success and no itching relief. I did not want to continue with the prescribed steroid cream for the side effects it is known to have. My wife found Champori online and we have had great success with the cream/spray combo. The itching was relieved almost immediately and as you can see from the before and after pictures the patches are considerably less and almost gone in some areas. I have had much relief from the Champori product and will use nothing else. Thank you! Just wanted to thank you for this wonderful product; my father has suffered from Seborrheic Dermatitis on scalp for more than 40 years, and I am always sending him “remedies" I run across. Nothing has ever done much for him until the Champori; he would always humor me and try what I found, but had pretty much given up; I sent him the Champori around Father's Day and he called the other day to tell me the dermatitis is gone!! I just sent some of your product to my uncle who suffers as well; am confident he will be just as ecstatic! Thank you so much!! product. I am attaching before and after photos. I plan on ordering more of your product for my other family members. They will not believe it, for they too have suffered tremendously. I love you for this. I love your product. It's the only one that works. 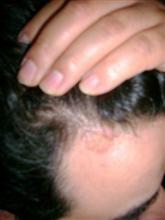 Attached are before and after pics of psoriasis on the top of my forehead. I used the spray and cream twice a day for a week - after just a few days I noticed the spots started to fade and the rough patches started to clear up. It hasn't cured my disease but it sure makes it manageable. Sadly, I didn't take any 'before' photos as I thought this cream, like all other creams I have tried just wouldn't work. I was wrong! Psoriasis has plagued my life for the last five years. Steroid creams were fierce and made my skin worse. I stumbled across Champori on a psoriasis blog and can honestly say your cream has changed my life. My arms are now free from psoriasis completely and I see more disappearing from my legs each day. I know I will be clear from psoriasis within the next couple of months. I am so grateful. What’s more, you provide a first class service to the UK. Thank you. Nothing I tried worked. Steroidal creams only gave mild relief. I'm amazed with the results I've had with using Champori for just 2 days. I'm sending you the pics of my leg. Well, is not gone yet but I can see much improvement. Surprisingly the results I've had for my scalp are even better. I can now feel my scalp instead of something that felt like crust. There were no flakes on my pillow the last 2 nights. I hope I can get rid of this scourge, or at least keep it under control. Thanks again. First of all, I would like to thank you for this wonderful cream. It works wonders, thank you again and again. My name is Ariana. I have had psoriasis on and off since my teenage years. 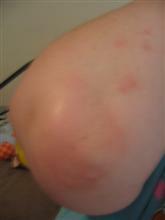 Most of the time on my scalp in springs and falls but last couple of years it spread to my back and breast area. 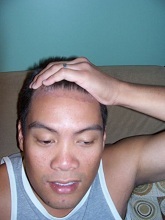 Last year when i moved from Europe to Asia things got out of control, patches over my scalp and body grew in sizes and started to itch and bleed. 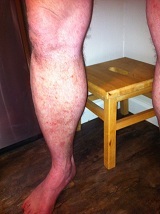 Later psoriasis even spread even to my legs and arms. I have tried different creams, shampoos and diets, and even meditation to calm myself down. Nothing seemed to help. i used to spend all my free time (days and nights) in the internet searching for information and hoping there would be some new method of treatment. I came across Champori in one of comments to the article about psoriasis in the newspaper website. I searched for it, and found only positive responses. I must admit, I was still very skeptical even when I was ordering that. My husband and I decided to go for the biggest spray and cream combo. We expected to get one of those ''big'' cream jars with double bottom that has very little of the cream itself (as with most internet-marketed creams) But Champori proved all my expectations wrong: no double bottoms, just opposite, the cream jar and the spray bottle had very thin walls and the cream was enough for whole 4 months even after applying all over my scalp and body. I am 66 years old and first contracted psoriasis about a year ago. Legs and arms were the worst but also had it in my scalp and on my back. Tried a bunch of stuff, prescription. over the counter and mail order. Most were pretty useless. I just wanted to write to you to tell you how impressed I am with your product. My cousin has suffered with psoriasis for years, and I ordered champori cream and spray for him after reading many of the testimonials on your site. Honestly, I didn't have high hopes that it would work, but his entire stomach, legs, and arms are covered with red, flaky, itchy skin, and I just hoped that SOMETHING would work. He just called me to ask me to order him some more - your product has almost cleared his entire stomach and has entirely cleared his arms. He sounded SO happy - and he's only been using your products for about 6 weeks. Your products have made a huge difference in his life... thank you, thank you. Thank you for your product. 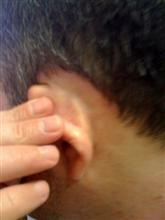 I have seborrheic dermatitis inside my ears, it covers all the tissue. Itchy, flaky, painful and very unsightly. Meds. I rec'd from doctor, mostly steroids, did nothing but cause infection. … I looked at consumer rating websites and found champori at the top and bought the smaller set. … The icky stuff is totally gone. It began to clear in just a few days. I now use it once a day and my ears are completely well. I am a medical professional and would not normally go for herbal products, but this is spectacular. I appreciate that the ingredients are listed. Again: thank you so much! I ordered the psoriasis spray and cream on June 25th. I found your website from some positive reviews on the web. I was very skeptical because I have tried a lot of things and none of them really worked. 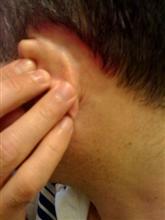 I have had psoriasis behind my ears near the hair line for about 10 years. To my surprise your products actually did work fantastically! My psoriasis has cleared up almost completely. This is the best it has ever been. It works 10 times better than the prescription that my doctor gave me for Dovonex. This is a great product that actually works. I have already told someone about it and will continue to tell any strangers I see with psoriasis. The reason for this is because I wish someone would have told me before I knew about it. Thank you. Great product!